With a growing demand for a new mod, it's finally here: players on survival mode can keep their inventory in Minecraft after they die! This mod allows players to keep their inventory if they were killed by creepers, wither skeletons, accidentally falling into lava, etc. Every Minecraft player has been in this experience before: they collect dozens of diamonds, redstone, leveled up to level 30 for enchantments, and boom: you suddenly die by any monster, accidentally falling into lava or accidentally looking at an Enderman. After the player dies, they have to start all over again with no equipment and can either (a) go back to where they died to try and salvage what they lost or (b) start all over again. After a while, starting all over again can really strain the player’s patience and love for the game. 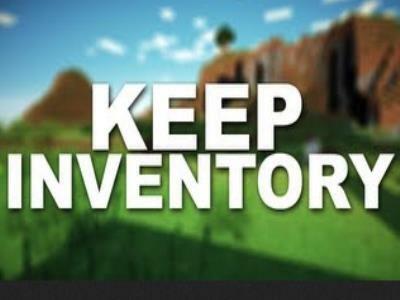 With the Keep Inventory on Death Mod, players don’t have to worry about their inventory being lost and starting the game again with all the equipment, minerals, and tools they collected. By installing this mod, even if you are in the depths of the Nether or in the depths of an ore-rich cave, you can be rest assured that you will not lose your items and will respawn at your last spawning/sleeping point. Although you may lose your leveling up after you die, the most important aspect of this new mod is that you get to keep your entire inventory after you die. The Keep Inventory on Death Mod for Minecraft will allow any player to keep their inventory intact and continue to play the game without stress, losing rare materials, or even losing your armor (if you have diamond armor, this mod is definitely a plus! ).